It’s been about 6 mo. since the release of Divi 3 and my initial review of the Divi 3.0 theme. So what do I think of it now? Better Worse or about the same? In this review I’ll let you know and give you a little tour of what the Divi theme is all about. It’s my mission to help you find the best and easiest ways of building high quality websites. I purchase and test website building tools and create tutorials to help you find the best and easiest ways of making great websites. Let’s Dive in and see if Divi 3 is right for your next website project. My #1 take away after using Divi 3.0 for the last few months is that it has spoiled me! Once you get past the initial learning curve of using the builder. Which I have a free Divi page builder tutorial on. Divi just makes it fun to design and build pages! After a bit of time the Divi page builder it it starts to feel like second nature. It just feel like how you are supposed to work on and design pages. Here are a few of the pages that I desired with the Divi theme in the last few months. As you can see you can create some really nice looking pages with Divi. One of the big features that I miss when I’m using other page builders are the keyboard shortcuts. You can see all of the available keyboard short cuts by hitting the ? button when you are in the visual builder. The short cut that I use all the time is the Undo Shortcut, cmd + z on mac or cntrl + z on PC. I’m constantly using undo after adding something or changing something and then deciding that I don’t like the way it looks. The keyboard short cut is so much faster and more precise then trying to dial a setting back to exactly where it was. I also really love the flow of the page builder and the fact that it doesn’t have any side bars or tool trays. I really like being able to clearly see my design as I’m working on it. When you want to add a new module row or section the plus icon is always right where I need to to add a new section. No dragging around or adding a new section to the bottom and then dragging it back you where you want it. You just add it right where you need it. The Divi theme is of course fully responsive. So that means that you site will automatically resize to fit any size screen. Divi also offers the ability to tailor sections or certain setting specifically for certain size screens like tablets or phones. So that you can really tweak your designs to make sure that they look great on any device. Getting a jump start on building and designing pages is another great strength of the Divi theme. One of the features of the divi theme is portable pages. This allows you to work on a page design on a development site and then move that page design easily to you live site. This makes re-desing pages or creating new pages really easy. You don’t have to work on it on your live site. It also means that you can share or get page templates from other people. So have 3 free Divi page templates that I’ve created. You can download them for free. I’ll link to them in them in the description below. There are also a ton of other free page templates available for Divi that you get download and use and modify to get a jump start on building you site. One of my complaints in my last review of the Divi theme was that you had to be really careful about saving your pages. It was really important to remember to save your page before you left the visual builder. The Developers behind Divi not only fixed that but they took it like 10 steps farther with a recent update. Now with the Divi theme while you are working on your pages an adding new elements and making changes to your design divi is saving a log of all of those changes. If you loose your internet connection or accidentally close your browser all of the changes that you have been making are being saved. When you open back up the page and start editing again Divi will ask you if you want to restore the last changes that you make. This is huge. So often when I’m building and designing a page in Divi I get lost in the flow. I know I should be saving but I just want to keep designing. Now with Divi you don’t have to worry quite as much about saving, because Divi is doing that for you as you go along. So Good Even Professional Website Designers Use It. One of the awesome things that I have discovered about the Divi theme in the last 6 months is that there is an amazing and friendly community of users around the Divi theme. There’s this one Facebook group that I’m a part of, the Divi Theme users group, where people share ideas designs and ask for help. It’s a great mixture of people. It seems that most of them are professional web designers but some of them are newer to building websites. It’s a great place to look for new ideas or find out the latest with building and designing with Divi. The fact that there are so many professional designers using Divi to me says a lot about the power of the Divi theme. Not only is Divi easy enough for someone new to building websites to use, but it’s also powerful enough for professional web designers. It’s truly a theme that will Grow with you as you learn more about building and designing websites. One of the exciting power features of the Divi theme is the ability to do in page split testing. This allows you to test just about anything on your site. 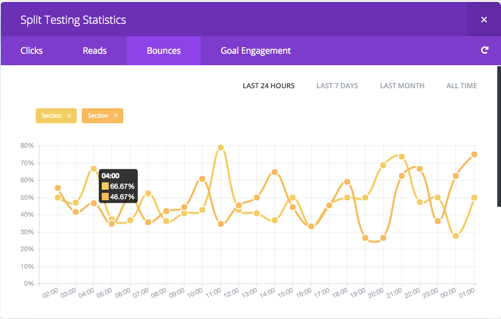 You can now find out what is and what isn’t getting your audience to take action on your site. With this feature and the ability to quickly design pages I think that Divi theme could be great for creating Sales funnels. It seems to have the perfect combination of tools and feature to create great sales pages and sales funnels for a lot less then other sales funnel tools. You get a lot more then just a theme! With a license for the Divi you get a lot more then just the Divi theme. You also get access to all of the plugins made by elegant themes the developers behind Divi. They have two stand out plugins that are designed to help you grow your site and build your audience. The Bloom plugin is an email opt-in plugin. It works with a ton of different email marketing solutions like mailchimp, awebber, constant contact and a bunch more. The plugin allows you to easily create and design email opt-in forms. Bloom takes it a step further by giving you many different options as to when and how those opt-in forms will show up to your viewers. You can have forms fly in pop up and set different sorts of triggers. Like a timed trigger that shows up after you viewer has been on a page for a certain amount of time. Or you have them show up when a viewer reaches the bottom of a page. You can also set up different forms to show up on different pages or categories on your site. Just tons of options to help you build your email list. There is also the Monarch plugin which is designed to help your audience share and like your content on social media. Here again you get different options as to how this will display. As a floating sidebar on the side of your pages. As an automatic pop-up or and automatic fly in. There are a ton of other options, settings and features to help you get your viewers to share your content. Build as many Sites as you want! With a license for the Divi theme you get access to Divi and the Extra theme. The Extra theme is like Divi but setup for creating newspaper and magazine type websites. You also get access to the great plugins that I mentioned. The license also allows you to build as many sites as you want. So if you think that you might be interested in building websites for other people the Divi theme is set up to allow you to do that. There are two tiers to the Divi Pricing plan one is the yearly plan. This gives you access to 1 year of technical support and 1 year of updates to the theme and plugins. The theme and plugins will continue to work after that year, you just won’t have access the the updates or technical support. The second tier is the lifetime plan. This is the one that I wish I had signed up for when I first found out about the divi theme. It gives you access to all of the themes and plugins plus lifetime updates and lifetime support. I look at is as paying a small onetime fee for a web development team that keeps working in the background to keep making my website better. And of over the years the developers behind Divi have shown awesome improvement to the theme and plugins over and over again. So I think it’s actually a great value. I think that my favorite part about the Divi theme is the commitment to constant improvement. Divi doesn’t just keep up they continue to innovate and continue to push to make the theme better and better. So as you can see I still really like the Divi theme. It just keeps getting better and I expect it to keep on getting better. If your interested in getting the Divi theme check out the affiliate links below and if you choose to get the Divi theme it will cost you nothing extra and help to support tests and reviews like this. After denying WordPress for a long time, I eventually reconciled myself to accepting it in my life. This lead me to a frustrating search for a really customisable theme. In days of old when I built the odd web site, a bit of HTML via Homesite could plonk anything anywhere on the page and suddenly being constrained by CMS and a theme which only allows the layout that it allows drove me nuts. So, here I am at Divi’s door after my sister in law had a site designed within Divi, which I thought was rather nice. A bit of research revealed that Divi is much more than just a theme. Here’s to Divi helping me accept WordPress without crippling limitations and the necessity to relearn HTML or some other fancy custom language. And thanks, Tim for the honest reviews which ultimately swayed me towards Divi. ps – Homesite should tell you how long ago it is since I built a full web site! Thanks Grahm! Yeah Divi so far is the best and easiest way I have found to build great websites. Glad you have found Divi! Thanks for your information and desire to help us. I know NOTHING about building a site and have only got as far as securing my URL, hosting it on Blue Host, and downloading WordPress. Everything has come to a screeching halt now. I need to build a membership site. My question is – is it really as simple as you make it look with Divi? Do I need to grab the WordPress plugin for membership sites and then buy Divi and start building away? Sorry for the completely novice/rookie question but that’s what I am when it comes to this stuff. I have hired designers in the past but the finished site just never quite looks like at I want. Plus I want to learn how to build a site and have the capability to make design changes on the fly. 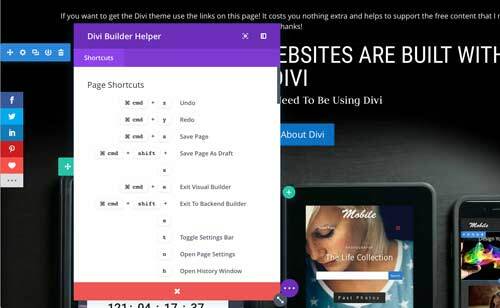 Building a site with Divi is one of the easiest ways of building a website that I have found. I would say that the difficult part is design. I think that it takes a really careful study of what other people have done, and a willing ness to be flexible and not try to force one idea if it doesn’t seem to be working. You can easily make a great looking website with Divi but in my experience it takes a little bit of time and practice to create good design. Again the key is to carefully observe and imitate what others have done. That will help you get off to a quick start. You can absolutely create a membership website with WordPress and Divi, but in my experience a membership site is a whole additional level of complication. Depending on the kind of membership site that you want to create there are several plugin options. I’ve used buddy press in the past which allows you to create a social network type membership site. This was a few years ago so things may have changed. It was fairly easy to setup but even with only a very limited number of members I found that it took a lot of maintenance and effort to keep it going. I also found that even with only a few members I really had to step up the hosting that I was using to keep the site from crashing. It can absolutely be done but it is not exactly easy. I look for the best and easiest ways of building websites 🙂 My personal suggestion would be to create your website with Divi then depending on the membership site that you want to create find a platform that specializes in that type of membership site. For example if it’s an online course you might want to look at teachable. If it’s more of a social network you might actually be better served by creating a private Facebook group. I’ve been playing around with DIVI to get the hang of it. Like your suggestion re setting up colour schemes as part of the initial set up of a site. A friend’s web site airready.co.uk uses what looks like a transparent overlay on a background image. (See behind the 3 blurbs ‘Additional Income’ etc) Is this standard divi or have they used some custom css. Can’t work it out nor find the same effect in the documentation. Found stuff using parallex effects. Maybe I’m missing something obvious, or perhaps running before I can walk! Yes you should be able to do that. Under the row settings select design then add a background color. Use the slider to change the opacity of the background. Use the Padding in the general section and the margin controls on the design settings to get the spacing that you would like for the section. Did you try or do you have any recommendations of creating a Divi website, but with a “mobile first” focus? Yes you can! You can actually use the front end builder in a mobile view while you are design your pages. You can also taylor elements and sections so that they are slightly different for mobile or for desktop to make sure that your viewers get the best experience on any platform. I’m a web designer who’s looking for a new, fast way of getting sites up without bothering a dev. My only problem with Divi that I can see is the mobile menus all look the same. Are there different variations of mobile menu? Can you use a wordpress plugin e.g. WP Responsive Menu, or edit the CSS to change style? Thanks for your help and advice. This looks like a good solution. You can use CSS to adjust the look of the mobile menu. There are several tutorials online. If you know how to code you can change just about any of the default stylings of the Divi theme. Elegant themes also has a tutorial and a pack of buttons for the menu styling. Here is a link: http://www.elegantthemes.com/affiliates/idevaffiliate.php?id=26271&url=35187 There are also lots of tutorial online about how to style the Divi mobile menu using CSS here is an example: https://creativechildthemes.com/blog/8-new-style-mobile-menu-divi/ The great thing about Divi is that it is very popular with lots of enthusiastic users willing to share their knowledge of how to add to and improve upon the theme. I have been using Divi for about a year and loved it until now… the new visual editor broke everything. Nothing works right anymore. I cannot edit in the dashboard mode and the visual mode is lacking. On one site in particular (cleared the cache and turned off all plugins) I cannot even edit it. So if your considering DIVI I would wait. This can happen sometimes with updates. I’m confident that the Divi team will get it resolved. In the meantime you should roll your site back to a previous version using one of your backups. In the past I did have a Divi backup that did not cooperate with my site. I just rolled it back and skipped that update and waited for the next. It worked fine after that. Hi Tim, I am and pretty new to WordPress and based on your reviews I have recently purchased the Divi theme (hope you received the affiliate commision). I am keen to get started but I am reading a lot about creating a child them and although initially, I don’t envisage customising the code, it might be required for my project in the future. Can I worry about creating child theme then and install one retrospectively without losing the work I have done to that point?